NETWORK UPDATE: BIG BROTHER gained 0.1 in final numbers, and the CRIMINAL MINDS rerun lost the same. In addition, both AMERICA’S NEXT TOP MODEL and A WICKED OFFER lost 0.1. CABLE HIGHLIGHTS: The Donald Trump Show came to CNN, and the network basked in his ratings glow, with a massive 4.94 in 18-49s (and 14.98 in M50+, not to mention 23.1M total viewers) for the main debate itself, and 1.01 for the showdown of the also-ran candidates. Pre- and post-shows also hit the Top 10, and so did Fox News’s O’REILLY FACTOR after the debate. The night’s other winner was Comedy Central, which premiered the new season of SOUTH PARK at 1.04, and followed it with the premiere of MOONBEAM CITY, somewhat diminished at 0.37. 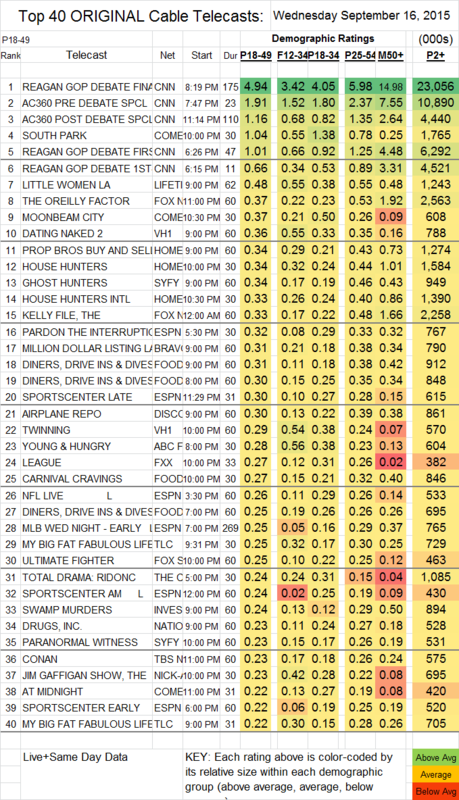 Lifetime’s LITTLE WOMEN LA slipped 0.03 to 0.48. On VH1, DATING NAKED rose 0.06 to 0.36, and TWINNING gained 0.03 to 0.29. HGTV’s shows were within a hundredth of each other, with PROP BROS BUY AND SELL and HOUSE HUNTERS at 0.34 (down 0.12 and 0.11 respectively), and HOUSE HUNTERS INTERNATIONAL at 0.33 (down 0.18). Syfy’s GHOST HUNTERS was down 0.03 to 0.31. On Bravo, MILLION DOLLAR LISTING ticked down to 0.31. On ABCFamily, YOUNG & HUNGRY dropped 0.13 to 0.28, and KEVIN FROM WORK fell another 0.03 to 0.09 (with 297K total viewers). On FX, THE LEAGUE didn’t hold at all well from its season premiere, down 0.22 to 0.27, while YOU’RE THE WORST was far more stable, down a hundredth to 0.15. THE JIM GAFFIGAN SHOW and IMPASTOR continued their dual runs, with GAFFIGAN at 0.23 on Nick At Nite (up 0.07) and 0.10 on TV Land (steady), and IMPASTOR at 0.16 on Nick At Nite (up 0.03) and at 0.08/384K on TV Land (up 0.02), while THE EXES (TV Land only) was up 0.02 to 0.10. On DAM, IMPACT WRESTLING was down 0.01 to 0.07 (with 258K total viewers) at 9PM and down 0.01 to 0.01 (with 62K total viewers) at midnight, while RING OF HONOR fell 0.01 to 0.02 (with 89K total viewers).